When it comes to Musical and high class, classic comedy and perfection in music numbers then it’s a Busby Berkeley picture. His films are always absolutely mind numbing and flooring when it comes to choreographing music numbers or building the amazing set ups that the stars shine during. He was a genius when it came to this reality. His visionary work, pioneering expertise in showcasing dance numbers and stage sets is beyond experience. You have to remember this was during the day when everything was done by hand, imagination and structure, it wasn’t simple drawing on a computer or touching a couple keys on a keyboard to create a film. This was during the time where your visionary want, was built and brought to life by artistry of the mind and hands. Of his over 30 pictures he directed, there is not one I do not like. I love everything he has done. Gold Diggers of 1935 is pure mastery. One of the greatest films out there. Busby was truly a gifted artist that not only directed, but had his hands in total production in making the film. His dance movies and music numbers and visionary imagination shine in all his works. I was again super excited when I learned this was going to be one of Twilight Time's 3,000 Unit Special Edition Blu-ray’s. If there is one singing actress or actress period, that should always be talked about and remembered in the history of the cinema world, it is the truly gifted, one of a kind, masterly voice and performances of Alice Faye. She was a goddess of sound, beauty and a total acting attitude that shined. Many actresses could never dream of having her ultimate ability of performance. She stars in The Gang’s all Here and owns every bit of it. This movie shines because of her. Also starring the one and only personality of Carmen Miranda. She died way to soon, 46 from a heart attack. A heart attack that took away her beauty and mastery in film and performance. She truly was one of those interesting stars that shinned and created an atmosphere like no other. Her beautiful smile was truly breathtaking. It was wonderful seeing her again in this film. Also the movie is filled with a vast array of acting and musical excellence. The one and only musician and composer and actor, Benny Goodman. There will never be another Benny Goodman, he was music. He shines in this film as always. I have often felt that this movie has never gotten the love it deserved. It has a low rating and a mix of critics. I for one think it’s a great classic musical with amazing acting and equally impressive direction. The music is perfect. The entertainment gets you pumped in that old style of dance and song. These movies bring back a classic sense of entertainment and in my viewpoint is an important part of cinema history that should always be experienced and shared. Thankfully there are companies like Twilight Time Blu-ray that care enough to give these older films a new home, and new outlet to be expressed and taken care of for a new generation. Twilight Time has done it again, simply put an amazing Blu-ray with a classic sense of olden day nostalgia. Once again I feel like I repeat myself over and over again, but it's the honest truth, Twilight Time makes these films shine on High Definition transfers. The film is vibrant, beautiful colors, crisp imagery. The sound quality is spot on entertaining. The music numbers through the audio is breathtaking and make you want dance. Another flawless wonderful job by Twilight Time. Isolated Score Track. (with some dialogue and effects). The composer behind the music is another one of those wildly important figures in music and film history. Not only a composer but a lyricist. Amazingly he won 3 Oscars but was nominated a 11 times. His talent is almost wordless. It’s hard to express the amazing quality he had writing and composing for film. My personal favorite is for the song Lullaby on Broadway. He worked with director Busby Berkeley many times. Warren was one of those brilliant genius that seemed to never do anything lack luster. It was like his passion and soul for music wrote the very definition of music. Mixed with the visionary talent of Berkeley it was almost like seeing to infinite gods of their craft coming together to create the big bang. Warren was such a master that well over 800 songs he wrote, and amazingly, many of those songs are still sung today, or used today, or remembered today. Just read a few of his songs I will list and the majority of anyone reading this, has heard, or sung, or experienced his lyrics: "I Only Have Eyes for You, "Jeepers Creepers", "We're in the Money", "That's Amore", "At Last", "Chattanooga Choo Choo" and so many others. His music is still used today on soundtracks and are you ready for this, as of this writing his music has been used on 1 thousand 700 movie soundtracks. If that doesn’t say something, then nothing will. Great special feature supplied by Twilight Time. You get two audio commentaries and both are very informative for any lover of cinema history. Both listens are well worth the time. The first commentary is a little long winded and Drew Casper tends to repeat himself over and over again which was a little turn off, but still was a great listen. The second I found much more entertaining listening to the three film historians. It was paced better and felt like average people discussing a film without going into a lot of high class mumbo jumbo. Film Historians Glenn Kenny, Ed Hulse, and Farran Smith Nehme really know cinema. Busby Berkeley: A Journey with a Star. This is a little over 19 minutes. It has a wonderful collection of film historians talking about Berkeley’s career, this was a fantastic watch. Alice Faye’s Last Film: We Still Are! This program is a little over 24 minutes and it has a collection or a memory lane of Alice’s films. A great little older retrospect of her amazing career. A great watch. Deleted Scene: The $64 Question. This is a little over 5-minute deleted scene which was great to see, for this was my first time seeing it, and so that was a treat. You also get to me one of the most important parts of the Twilight Time Blu-ray’s the booklet inserts by film Historian Julie Kirgo. I love reading these booklets and looking at the beautiful pictures from the film. As always a great read by Julie, the film historian guru. Again I am utterly satisfied. Pure entertainment through a flawless Blu-ray. Twilight Time aces it so many times, but they really aced it with this one, great collection of special features, a beautiful visual transfer, and an audio journey of music bliss. Highly Recommend. 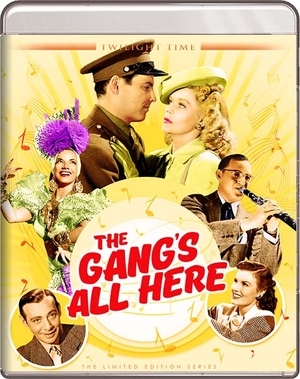 A must own Blu-ray that really needs to be experienced in all it's amazing musical, classic glory.